Dubai, March 19, 2019 - Faisal Holding the pioneering investment holding company with over 44 years of widespread presence in the Middle East, expands its horizons by signing a joint venture with Spanish giant, Asisa Group. The project is named Faisal Holding Asisa Dental Network, which will be operational in Dubai & Abu Dhabi and soon across the UAE. The joint venture will cater to the local and expat residents of the emirates, it would offer an international dental network clinic focusing on quality, integrity and world-class service. Faisal Holding was established by H.E. Sheikh Faisal Bin Sultan Al Qassimi, in Sharjah, and as a step to consolidate the various business that originated in 1975. Coupled with its specialization in construction related developments and large-scale projects along with its keen understanding of the global market, over the years, Faisal Holding has expanded into property and real estate management, investments, retail, hospitality, integrated marketing services, and the healthcare sector. Asisa Group is the largest medical corporation in Spain with over 40 years of market presence and was listed as the world’s 4th top Group. Asisa Group has created one of Europe’s largest dental networks of solely owned clinics – Asisa Dental. Asisa Dental prides itself on maintaining patient satisfaction as its top priority along with the integration of the highest quality treatments across all its medical procedures. The proven track record of more than 20 years of patient satisfaction, further reinforces Asisa Dental’s continued success in the dental industry. Mr. Brett Schafer Chief Executive Officer - Faisal Holding & Director- Faisal Holding Dental Network commented, “Our research and development team have studied the markets and have identified the gaps in the healthcare industry. With our UAE market know-how and along with Asisa’s expertise in dentalcare, the joint venture will guarantee quality dental care which sets us apart from existing dental services. This is the first international dental network which will be launched in the UAE market. The clinics will be operational in a couple of months, where the networks brand name will also be revealed. About Faisal Holding: Faisal Holding was established by H.E. Sheikh Faisal Bin Sultan Al Qassimi, in Sharjah, and as a step to consolidate the various business that originated in 1975. Coupled with its specialization in construction related developments and large-scale projects along with its keen understanding of the global market, over the years, Faisal Holding has expanded into property and real estate management, investments, retail, hospitality, integrated marketing services, and the healthcare sector. The pioneering investment holding company has a widespread presence within the Middle East. Faisal Holding prides itself on their culture of integrity, sustainability, innovation, and value creation. The subsidiaries of Faisal Holding are Toyworld Distributor LLC, Faisal Holding Investments, Faisal Holding Hotels, HMH - Hospitality Management Holdings, and MPJ – Marketing Pro-Junction. Furthermore, the associate companies of Faisal Holding include GIBCA, REEF Real Estate Investment Company LLC, RSO, and Grand Stores LLC. About Asisa Dental Network: Asisa Dental is a part of the renowned Asisa Group that is the largest medical corporation in Spain with over 40 years of market presence and was listed as the world’s 4th top Group in the world. Asisa Group has created one of Europe’s largest dental networks of solely owned clinics – Asisa Dental. Asisa Dental prides itself on maintaining patient satisfaction as its top priority along with the integration of the highest quality treatments across all its medical procedures. The proven track record of more than 20 years of patient satisfaction, further entails Asisa Dental’s continued success in the dental industry. Asisa Dental is focused not only on the results of the treatments provided to its patients but equally on keeping a close eye that endures post-treatments, follow ups, and necessary assistance are provided to every patient to ease any of their concerns or doubts. Asisa Dental’s European presence spans across Spain, Italy, Portugal, as well as clinics in Latin America. The joint venture Asisa Dental has with its partners reinforces and leverages its international presence and broadens its horizon. The expansion strengthens Asisa Dental’s market knowledge of dental care by delivering the goals that matter most to the patients it serves. 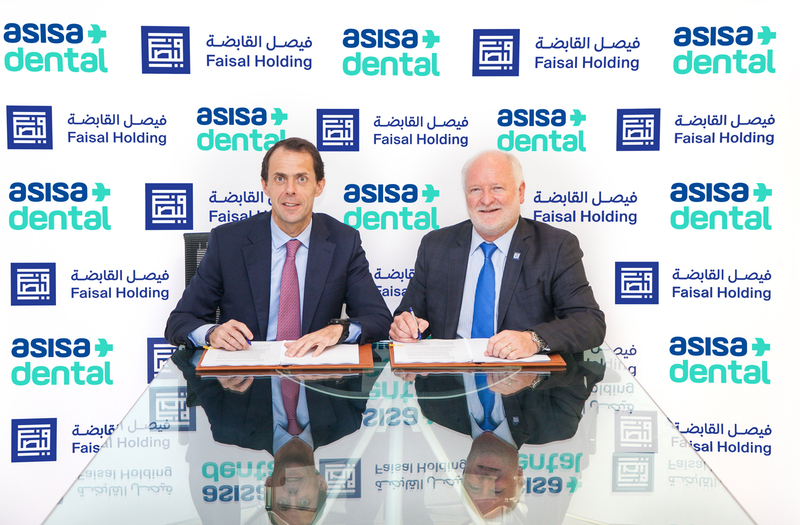 Asisa Group also has a joint venture with Faisal Holding, named Faisal Holding Asisa Dental Network, where jointly a Dental clinic network is operated across the UAE.